Mold Test Kit - Determine if visible discoloration is toxic or common mold. Are you concerned about visible mold growth being toxic? 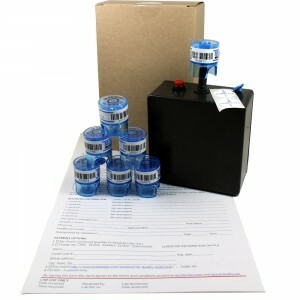 The Visible Mold Test Kit allows you to easily collect up to 3 surfaces samples. Samples are mailed in for identification by a certified microbiologist at our laboratory. We accept samples from clients nationwide. Volume orders? Contact us for details. 1. First, purchase your Visible Mold Test Kit by selecting the number of samples you want analyzed. The Visible Mold Test Kit allows for up to 3 samples to be collected. 2. Next, you’ll receive your Visible Mold Test Kit in the mail by ground shipping. Call or email for rush shipping prices. 3. 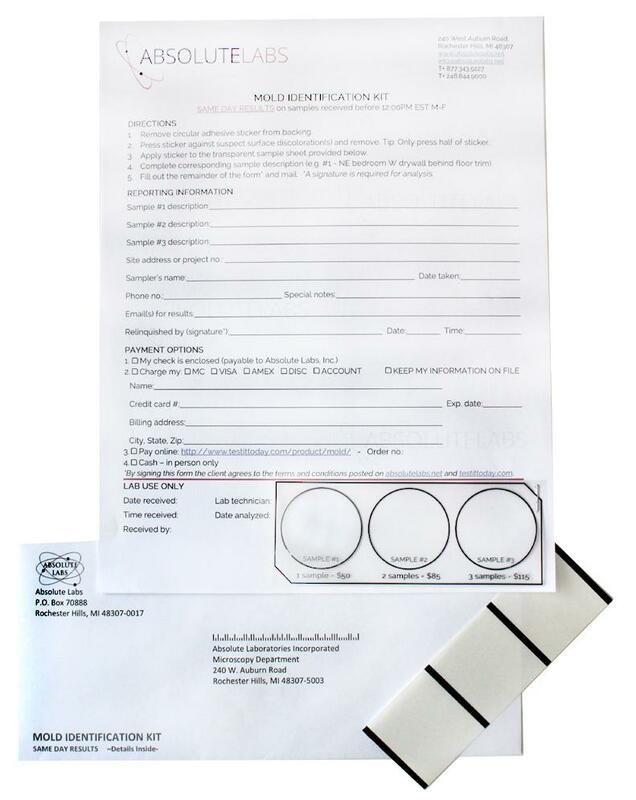 Lastly, follow the step-by-step instructions included in your Visible Mold Test Kit and mail the sample(s) back to our laboratory. A PDF report will be sent to your email that contains mold identification, to the genus level, and classification as toxigenic or non-toxigenic. Mold growth occurs when there is long-term moisture on building materials. In indoor living spaces molds are commonly found on plant-based materials like wood, cardboard, and paper-backing on drywall. Less frequently, molds are found on smooth building materials including cement, concrete, plaster and plastics. Certain mold types are capable of producing harmful mycotoxins; these molds are classified as toxigenic. If you suspect discoloration on a surface to be mold growth, the Visible Mold Test Kit can be used to take a sample for laboratory analysis. Each sample is evaluated for potential toxigenic mold types, including the notorious “Black Mold” (Stachybotrys chartarum). Collecting samples is easy to do. Mold test kits include step-by-step instructions. High humidity areas. Mold growth is very common in attics where hot humid air vents directly into the attic space. Behind walls: if you suspect mold growth is behind a wall please call us. Customers who call about mold growth behind walls and purchase the air quality test kit are provided with a wall probe and instructions on how to sample air from behind their wall.